A study in Science reports findings from an analysis of over 83,000 applications for R01 funding between 2000 and 2006. 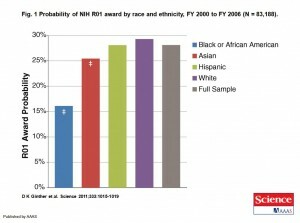 The researchers identified the race of the applicants to determine the likelihood of receiving an NIH grant. They found that self-identified Asian investigators are 4% less likely and African-American investigators 13% less likely to receive funding than white applicants. The disparity went away among applications with similar priority scores. It seems that very little in the application would distinguish the race of the principal investigator, so reviewer bias (unconscious or not) is probably not the main cause. Rather, minority applicants may receive less mentoring in how to formulate and write a proposal. This entry was posted on Friday, August 19th, 2011 at 9:09 am	and is filed under Faculty development. You can follow any responses to this entry through the RSS 2.0 feed. Both comments and pings are currently closed. Respect to op , some good selective information . “When you cease to dream you cease to live.” by Malcolm Stevenson Forbes. I am curious to find out what blog system you’re using? I’m having some minor security problems with my latest website and I’d like to find something more safe. Do you have any suggestions?